Wedding season tends to vary slightly from year to year and from venue to venue, but nowadays, most weddings tend to fall between the popular May to October window. Whichever part of the year you find yourself in, there's usually a wedding somewhere around the corner to start thinking about. 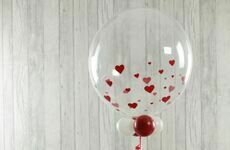 As Prty On Balloons will prove, there's a personalised balloon for every occasion - whether you're looking for the decorative finishing touches to your dream wedding location or you're looking to ask someone to be your Maid of Honour, we something for you to fall in love with. Make your proposal an elegant surprise with our stunning 'Will You Marry Me?' balloon! This gorgeous decoration comes with a range of unique customisation options to make your proposal a truly personal and creative affair - with a selection of fonts and colour schemes to choose from alongside your extra-special message. 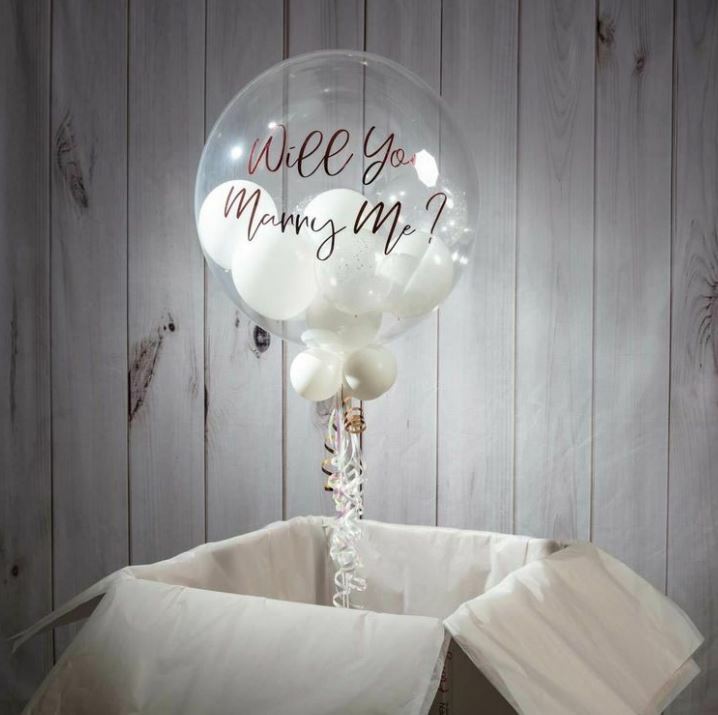 Our bubble balloons are a great way of popping the question to the helium fill which allows the balloon to float out of the box when opened, giving your partner the surprise of their life. 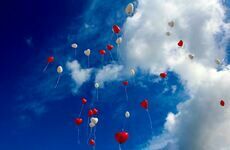 If you're not proposing you, you may be reaffirming your vows, celebrating an anniversary or simply reminded your partner how much you love them. 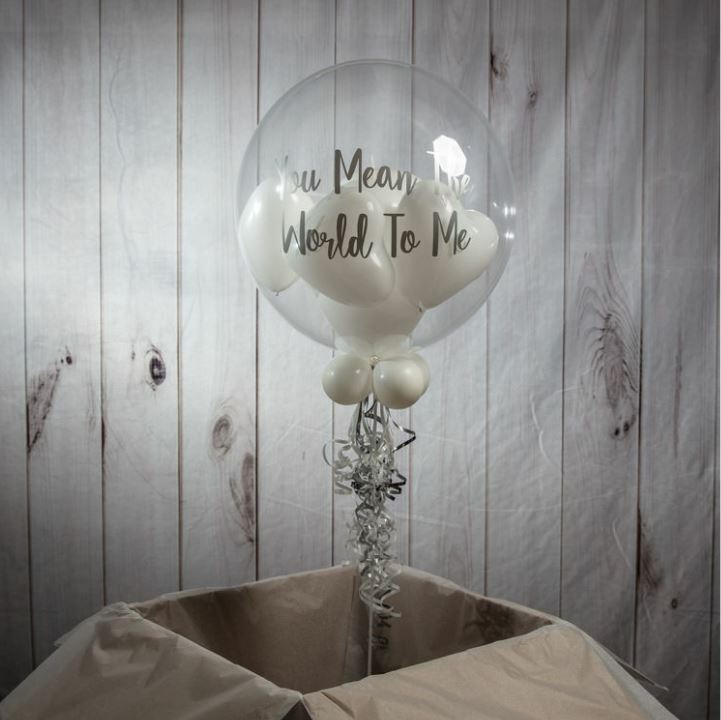 Personalising your balloon with 'You Mean The World To Me' or a similar heartfelt message will resonate with your partner whether you've been together for 5 years or 50. 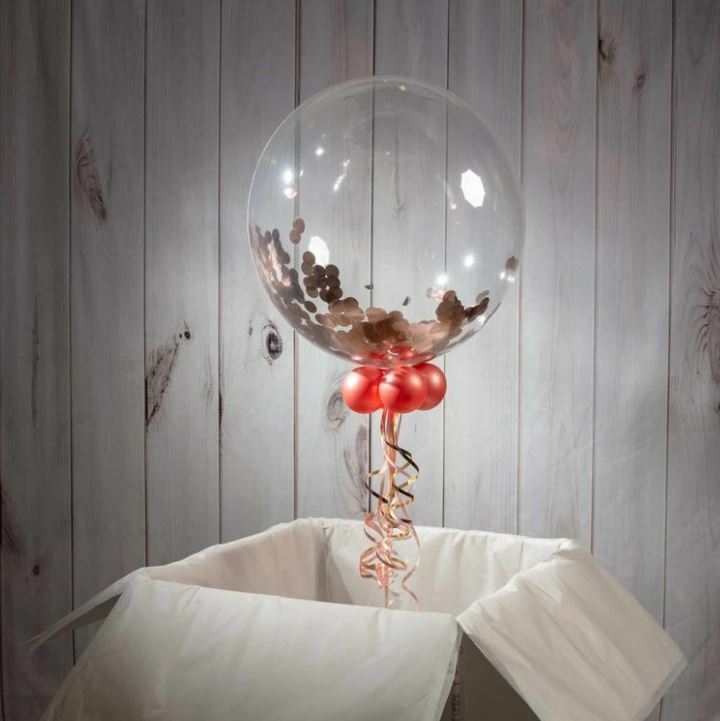 Finding the right decorative features to match your wedding venue can be a challenge, so why not try our personalised confetti bubble balloon? From rose gold & pink to black and white stars, choose from a range of 7 stunning shades or select our bespoke 'Choose Your Own' option to add a personal stamp to your big day. 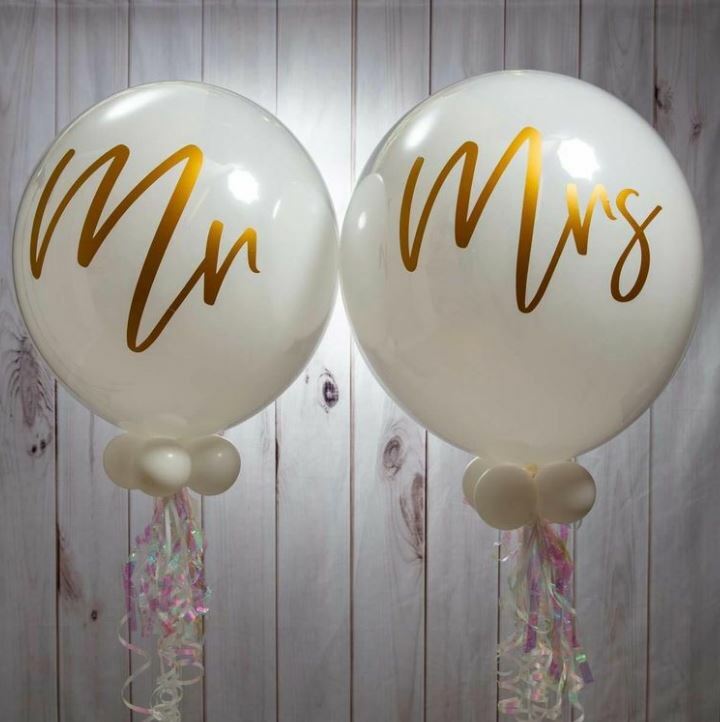 Whether you're a Mr & Mrs, a Mr & Mrs or a Mrs & Mrs, these super shiny printed balloons will look fabulous when placed anywhere in your wedding venue. Furthermore, you can choose a font colour to match your wedding colour scheme with our innovative customisation options and add a free message at the checkout if you're giving this balloon set a thoughtful gift. 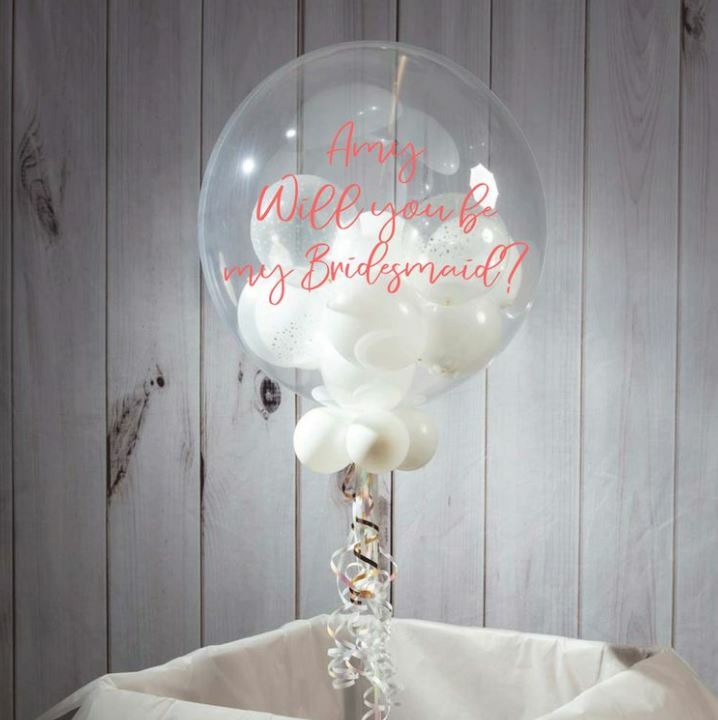 Our 'will you be my...' balloons are some of our most special decorations to recieve in anticipation of your upcoming wedding. More thoughtful and personal than a card - ask your friends and family members to take part in the ceremony with our 'Will You Be My Flower Girl? ', 'Will You Be My Maid Of Honour', 'Will You Be My Page Boy?' and 'Will You Be My Bridesmaid?' balloons. 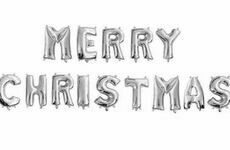 Whether you're planning an informal festive get-together with your family or prepping for the office Christmas party -Party On Balloons have got it covered!